Over 150 people of all ages sing in seven choral groups attached to Hildesheim Cathedral. Concerts given by the Cathedral ensembles are always a rewarding experience for music lovers. Do you love singing in praise of God and for your own pleasure? Are you seeking a group of like-minded people who share your love of music? Are you looking for a meaningful leisure activity for your children? Do you continue to enjoy the solemn tone of church bells? Do you love the magnificent timbres and sounds of a large cathedral organ? Even if only one of these applies to you, at Hildesheim Cathedral you’re in the right place! Over 150 people of all ages sing in seven choral groups. Whether your children have just started school or you would like to indulge your taste for Gregorian chants, we offer the opportunities and the right group for you. Music at the Cathedral has been under the overall leadership of the director of music, Thomas Viezens, and the cantor Dr. Stefan Mahr since 2007. Since July 2014, Georg Oberauer, assistant director, has taken over choir rehearsal and sectional rehearsal functions. For our youngest singers the Cathedral offers the Boys‘ Choir (led by Thomas Viezens) and the Girls‘ Choir (in three sub-groups, led by Stefan Mahr). Adults also have a wide range of options open to them: from singing with the Schola Gregoriana choral school, in which men and women devote themselves to the oldest Catholic liturgical music, through the Cathedral Choir that perform the classic cathedral choral repertoire, to the Chamber Choir, in which experienced men and women (who are normally able to sight-read) take on challenging a-cappella works. These groups are each led by the director of music, Thomas Viezens. I n 2011 and 2012 the Cathedral produced two CDs. One of these, “I was Glad: the Girls’ Choir of Hildesheim Cathedral”, features 22 works performed by the Girls’ Choir. On the other disc the Cathedral Choir, the Chamber Choir and Schola Gregoriana, plus three of the Cathedral’s voice coaches together with Thomas Viezens at the organ of the St Magdalene Church (Seifert, III/pedal, 33 registers) and Suffragan Bishop Hans-Georg Koitz came together to produce the double CD “Heavenly Jerusalem: Music from the Mediaeval, Renaissance and Romantic Eras”. You can hear a piece by each of the choral groups on their respective pages. Have we awakened your interest? 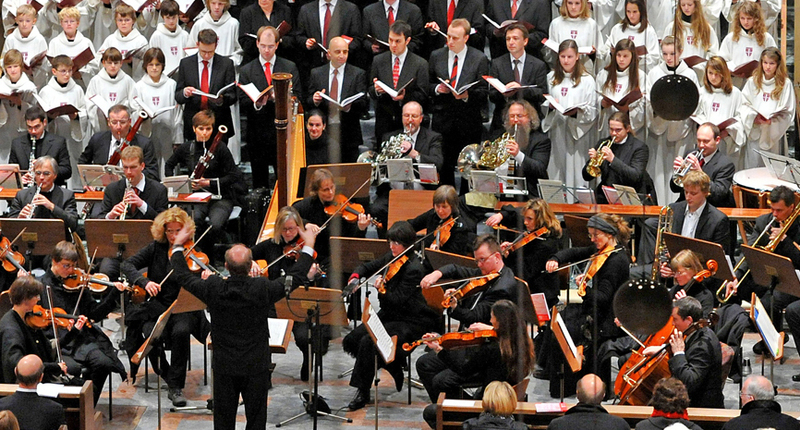 Why not get in touch – you will be warmly welcomed into the musical family of Hildesheim Cathedral.